Xcaret means “little cove”, but this one offers you a sea of possibilities to have fun as you never imagined. Perhaps together with Chichén Itzá and Tulum, Xcaret is one of the most visited places in the Riviera Maya. Each year it receives around one million visitors, over an extention of 80 hectares and has attractions that were carefully planned for more than 60 months. Since 1998, they have received several awards ranging from environmental education programs, prizes for working conditions, accreditations for their care of the environment, tourism excellence awards and even world records for the preservation of local species, among others. The cost of admission varies according to the benefits that each of the 6 available packages includes and can be adapted to the needs of each traveler. The facilities of Xcaret are so diverse and have so many services, that you could spend several memorable days without repeating places or experiences. With so much to do in such a short time, maybe it can be overwhelming for some, that’s why we have divided the activities into 10 large groups, which will give you the opportunity to choose between several options; however, a comprehensive experience of all possibilities the Xcaret you most want. Walk along at least one of its 3 underground rivers. Azul, Maya and Manatí are the names of the underground rivers that are part of the network of channels that lie under the Yucatan Peninsula and that extend for more than 650 meters, during the journey you will discover Mayan cenotes, rock formations and marine fossils. The living orchid museum. Here more than a hundred plants are cultivated, among which there are 89 species of orchids, many of them in danger of extinction. Wild animal sighting. The unique characteristics of this park allow for a tropical jungle environment, this facilitates the sighting of several wild animals such as: Moreletti crocodiles, bats, jaguars, white-tailed deers, pheasants, tapirs, raccoons, spider monkeys and howler monkeys among others. The Coral Reef Aquarium. This place is one of a kind, thanks to the care of its hábitat, visitors can learn about the ecosystem of the underwater gardens, made possible by the permanent pumping of seawater that allows the controlled entry of plankton and sponge larvae, corals and molluscs, This venue has more than five thousand living organisms that have been colonizing this exhibit in a natural way. Xcacel turtle camp. With a permanent program for the preservation of sea turtles, Xcaret nowadays has one of the most advanced camps in the careo f these animals, which allows the release of 300 thousand pups per year. Manatee Lagoon. Meet Pompom and Nohoch, two manatees that inhabit the crystalline water of Xcaret lagoon, they are two marine mammals of the species Trichechus manatus that are currently in danger of extinction. Swimming at the Beaches, the Cove or in the Natural Pools. One of the great advantages of Xcaret is that it has ample spaces for swimming in which each traveler finds the adventure they want to have. The natural pools with seawater and subdued waves are the right place for families with children, seniors and people with little experience as swimmers; for young adults and people with previous experience with snorkeling, the Caleta is recommended, its depth is 1.20 meters and the waves and currents are controlled. Visit a plaza or venue of interest. After strolling, swimming and sunbathing, your appetite will surely be wanting you to stop somewhere to eat. Some packages, like the Xcaret Plus, include a buffette meal service that you can enjoy in any of its 6 restaurants with this type of service, or if you wish, you can explore the culinary possibilities in any of its restaurants with different gastronomic specialties, cuisines, services of fast food or bars and even carts with snacks. After lunch, we recommend a walk through any of the public squares and venues such as: the Main Square, the Hacienda Henequenera Yucateca, the Museum of Popular Mexican Art, the Mayan Village, the Plaza del Vitral, the Chapel of Guadalupe, the Bell Tower, the Chapel of San Francisco de Asís and the Revolving Scenic Tower. Visit an archaeological site. Polé, today Xcaret, has more than a thousand years of history and that’s why it has archaeological ruins of the Mayan culture, dated to the late post-classic period (1400-1517 AD), which must be covered if you want to have a complete tour. Archeological ruins. You can choose to visit the different structures of the main square, which are divided into four large groups among which you can find buildings, temples, murals with pre-Hispanic paintings and monumental platforms. Pre-Hispanic ball game court or Tlachco. It is a detailed replica of the one found in Copán, Honduras, and in which an interpretation of the ball game ritual is carried out. Ancient rituals such as: the Tlachco, the Prehispanic dances, the Ceremony of the Voladores and the Dance of the Owl. Musical shows such as: the Harp Recital and the folkloric dance exhibition of regional typical mexican dances. 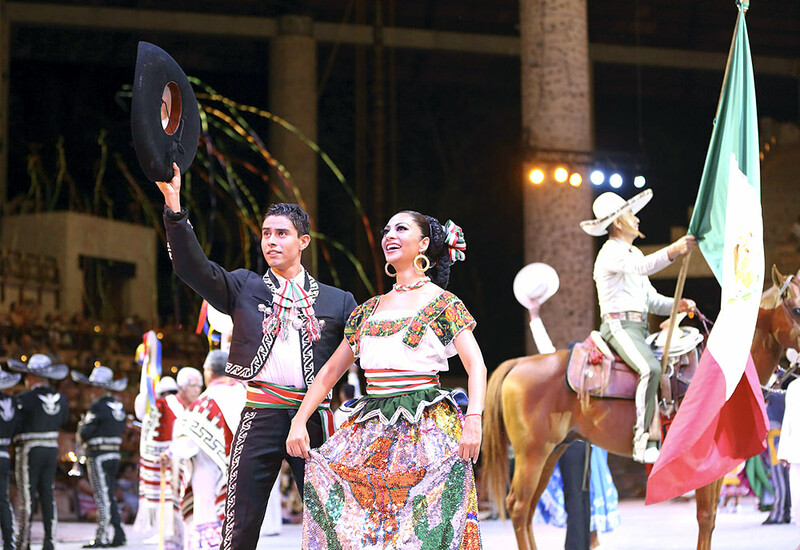 Entertainment Shows, such as: the equestrian show, the Botellofono and the representation of Xcaret México Espectacular with more than 300 participants including actors, dancers and musicians, of which the latter is highly recommended. Customize your experience with extraordinary activities and preferential spots. If whats included in your admission pass is not enough for your desire for adventure and exclusivity, you will not be disappointed to know that Xcaret offers more than 20 extraordinary activities for which you can pay to make your visit to this park completely personalized, such as: swim and / or interact with dolphins, nurse sharks, manta rays, snorkeling and private diving, underwater walks, therapeutic massages, cleansing therapies, temazcal, extreme activities, wine tasting, and preferential places and dinners among others. If you decide on any of them, we recommend you make your reservation ahead of time.